I fell in love with Pilates nearly 20 years ago. I’ve always loved exercise and learning about the human body. Pilates seems to marry the two. I like the idea of doing something that would give me protection against injury, and an achy back in later life. I love that Pilates is a great distractor. It is a mental and physical workout. You have to think about your breathing, core engagement and neutral spine with every exercise. You also have to focus on controlling the movement, making your muscles work harder. I did matt pilates for many years. But soon realised I needed to add intensity to my exercises. The reformer seemed like the perfect solution, you can add the springs, or take them away to make each exercise more challenging. I went to two classes and was hooked. I want to bring the London studio set up to local areas. 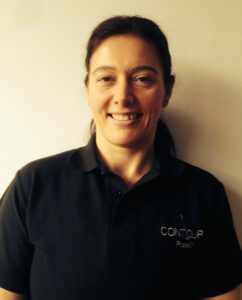 CONTOUR Pilates is a warm and friendly studio where people can get a challenging whole body workout, taught by highly experienced instructors, and have some fun doing it. You will get a challenging whole body workout in a variety of classes. A Reformer Pilates class is a class like no other. It will zip you up inside, you’ll use muscles you never even knew you had and leave feeling like your whole body has been invigorated. Regular classes with us will give you a stronger core, stabilise your spine, improve your posture, work your arms and tighten those areas that some of us don’t like very much – legs, bums and tums. What happens at my first class? In your first class here at the studio, the instructor will take you through how to use the reformer to ensure that you are comfortable with the techniques. You will learn about engaging your core, alignment and the breathing. Don’t worry that you won’t get a workout the first time – rest assured that you will! PLEASE COME 5 MINUTES BEFORE the class so that we can give you a health statement to fill out. After a few classes, you’ll become more familiar with the reformer, the springs, your core muscles and you’ll begin to see improvements in your posture and flexibility. With regular class attendance, you can expect to feel stronger, and you will, in time, be able to do intermediate and advanced moves. As you become more familiar with the Reformer Pilates Machine, you’ll being to understand what makes Reformer Pilates exercise so addictive and effective. The faster you become the more confident you’ll be with the machines and techniques, and before you know it you’re muscles will start to lengthen and become leaner. Once you start getting a stronger core and more all over body strength, you can start trying our intermediate and advanced level classes. Martyna is a highly qualified pilates instructor. She has been an instructor for 10 years. She is originally from Lithuania, a nation known for its strong women. This is certainly obvious in her workouts. She loves to work people hard. She smiles and likes to create a fun atmosphere in her classes. But once you have started coming regularly she will start to push you. She will be smiling, but you may not. She also teaches ballroom dancing. Rona’s background is gymnastics. 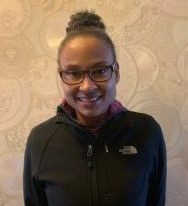 Going into coaching at an early age of 14 and becoming a fully qualified coach at 19, she ran a club for over 20 years, whilst working in Banking/IT in the city. After having twins in 2001, she decided to go into adult fitness and qualified in 2008. She has a level 3 qualification in Pilates, Personal Training and GP Referrals. Also qualified in spin/RPM, Boxercise, Core stability, Nutrition, Sports Nutrition, and Pilates for people with orthopaedic conditions. Currently, she is studying pre & post-natal pilates and hoping to go on and do level 4 lower back pain. In her spare time, she still enjoys training at an Adult gymnastics club and running around after her 3 children. The super strong lady. But she vows that she could only lift the weight that she can because she does pilates. 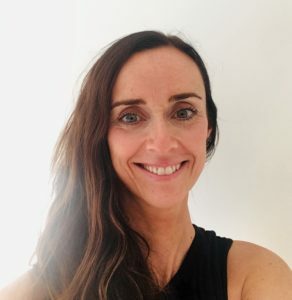 Helen has been in the fitness and health industry for over 15 years, during which time she has trained in a variety of disciplines from Personal Trainer to Pilates Teacher working with adults and children in the community and within local gyms. 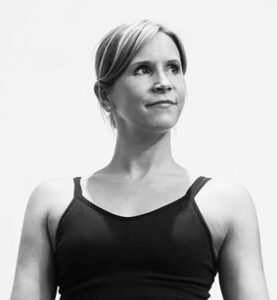 Having taught high energy classes for many years, Helen recognised that her body needed a little bit more attention and her passion became mindful movement where she now devotes her time to her community pilates/mindful movement classes continually helping others to learn how to release tension, move more freely and enjoy exercising without the ouch factor. 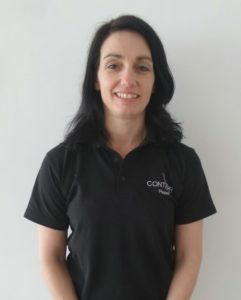 Helen is a qualified Stott Pilates Instructor in Matwork and Pilates Equipment and also a CYQ Level 3 Pilates Matwork Instructor with a certification in Level 4 Back Care. 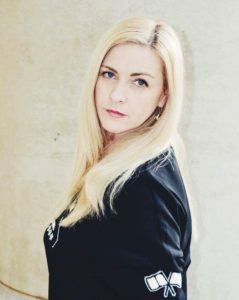 Vilma is a professional dancer and has performed hip-hop, house, contemporary before becoming a Level 3 Pilates teacher, fitness Instructor and group exercise instructor. She also holds Public Physical Health and Physical activity degree, qualified in pre-post natal disciplines, and nutrition. She aims to develop routines that stimulate and encourage everyone in her class and are always challenging. As a mum of 3 young children, pilates was a way for me to spend an hour a day being me again. I am a true believer of the link between having a strong mind and a strong body and pilates was the way for me to get that strong body. I originally decided to train in pilates because I wanted to be able to get the best out of my own self-practice, really making sure that I was in the correct alignment and caring for my body as I get older. So I trained with Polestar Pilates and now I can help my clients to get the same benefits from movement as I get. I have been teaching mat Pilates for 13 years and reformer pilates for 10 years. I have also trained a number of instructors as well. I would describe my classes as inclusive, fun, friendly and effective. I focus on technique and always offer regression and progressions so clients can work at an appropriate level to them. I focus on a whole body workout so clients feel balanced and trained after every session. In my spare time I like raising money for charity. I have climbed Ben Nevis, run the London marathon and am now looking to climb Machu Picchu in the very near future. I will teach you to move your spine and body in an efficient way to help with every aspect of your daily life. My classes are upbeat, dynamic and fun. My life has always incorporated fitness. In my earlier years, I was a member of the Great Britain diving team, winning bronze at the Junior Europeans. I began my fitness career as an exercise to music instructor and completed my Pilates training with Polestar Pilates. Six years ago, after being diagnosed with arthritis of my lumbar spine I discovered Pilates. Pilates has changed my life, I was suffering from back pain on a daily basis, incorporating Pilates into my fitness routine has made my spine feel twenty years younger.